At the edge of the garden at the Villa San Michele on Anacapri beautiful architectural details and Greco Roman fragments reflect sunlight on the marble, stone, ancient looking trees, and dark, waxy leaves and soft wildflowers. I find the ramble through the gardens of Anacapri (especially at the Villa San Michele) to be a bit fairytale-like, a bit dreamy. The dark, lush, green paths over stone and fragments of ancient Roman columns and statues; the intoxicating scent of flowers and herbs; the layered calls of forty different species of birds – all hold one’s attention. When the garden is not crowded one can find themselves utterly alone, with the run of the place. There’s a sense of timelessness walking the stone paths and climbing stairs boasting unreal views of rugged coastline with layers of rocky, verdant cliffs. The Villa San Michele is placed in a nonchalant rustic garden with the aesthetics of a museum,there lies an olive jar, with shadows dancing across its faded red clay and tiny cracks of time and age, the sunlight dappled amid a verdant spread of green. The stairs at the end of the winding pathway both beckon and frighten a little when walking alone on the labyrinthine pathways. A gorgeous cloak of wisteria entwine ivory columns and elegant topiaries. Mighty cypresses soar high as needly skyscrapers. The hint of other villas and other stories are tucked neatly into the old mountain. Bright yellow flowers grow in impossible places, their faces outstretched toward the sun. The heady flowering of spring, clean white blossoms breaking up the velvet thick gloss of leaves and tangled old branches, is in every turn. “The sacred mountain above San Michele is full of birds on their way home to mate and rear their young. What a joy to me that they can rest there in peace! Yesterday I picked up a poor little skylark, so exhausted from his long journey across the sea that he didn’t even at- tempt to fly away, he sat quite still in the palm of my hand as if he understood it was the hand of a friend, perhaps a compatriot I asked him if he wouldn’t sing me a song before he went off again, there was no bird-song I liked better than his; but he said he had no time to spare, he had to hurry home to Sweden to sing the summer in. For more than a week the flute-like notes of a golden oriole have been sounding in my garden. The other day I caught sight of his bride hiding in a laurel bush. To-day I have seen their nest, a marvel of bird-architecture. There is also much fluttering of wings and a soft murmur of bird-voices in the thicket of rosemary by the chapel.” The Story of San Michele by Axel Munthe. On the old stairs a soft moss blooms from stones, suggesting an endless cycle of spring and life growing in the garden. Far below a tiny shock of blue sits in between the fields and the bay of Naples; while all those lives play out from an Emperor’s ancienne vantage point. The Story of San Michele by Axel Munthe. The best view is from a quiet spot; a corner to stop in your tracks and allow the view to overtake your senses. 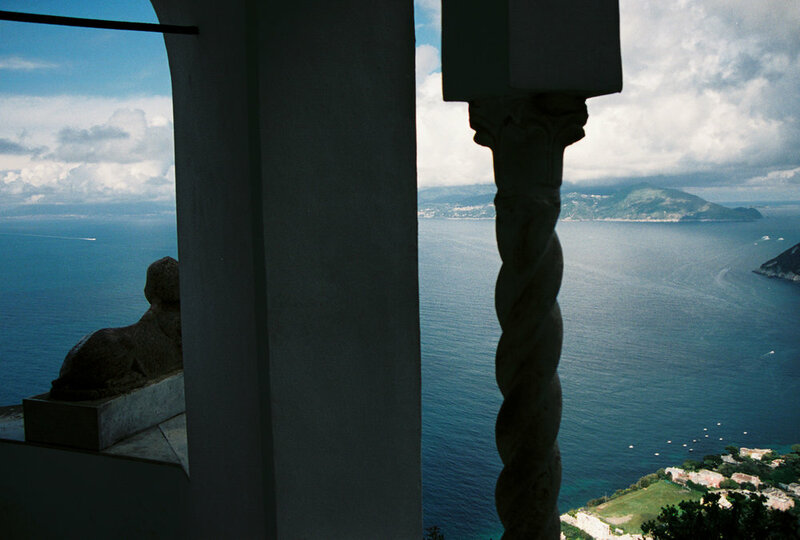 A sip of the island’s limoncello, tasting the scent of lemon flowers and the sea, listening to the pretty birdsong, closing your eyes to feel more intimately a lingering stir of the south wind on your neck, running your fingertips along the cold stone remnants of wall – all senses are occupied with Capri from way up here. On certain days when the weather is perfect it feels as if one could see the whole world from here. Some of the paths are winding, some are hidden until you come upon then suddenly, and some form entirely straight lines with edges and niches laid out for yards. A Greco Roman bust sits outside a small white chapel within the classic Italiani Giardini. Bleached tile stairs lead up to a former bird conservatory. A winged Egyptian bust overlooks the Marina Grande with Ischia faintly shimmering in the background through the low clouds. 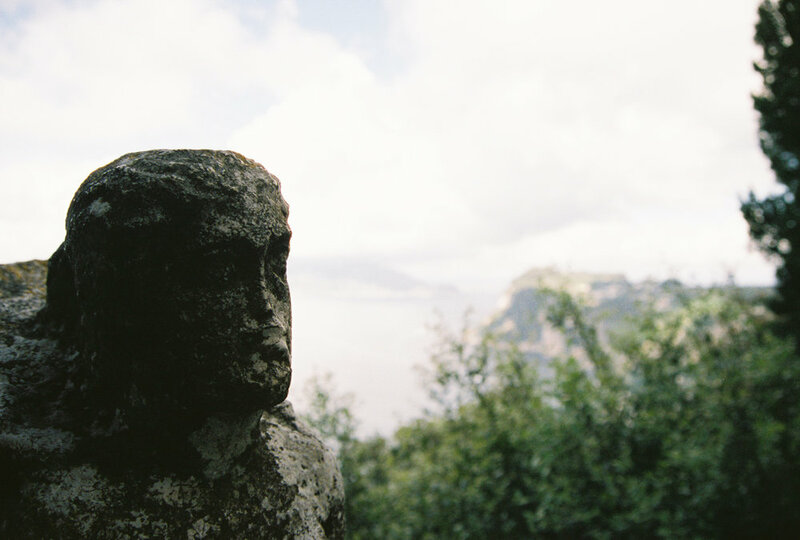 A sphinx watches over the emerald Tyrrhenian Sea; an ancient siren calling wanderlust to travelers. Standing in the garden of the enchantng Villa San Michele on Anacapri one has the the bird’s eye view of the Tyrrhenian Sea and of neighboring islands near the beautiful sweeping coastline of Capri. There is a tiny chapel in the garden. Cypress trees and gorgeous pillars line the terrace overlooking the ocean. There are a series of stairs leading to sumptuous turns of the garden and pathways further up the hill. 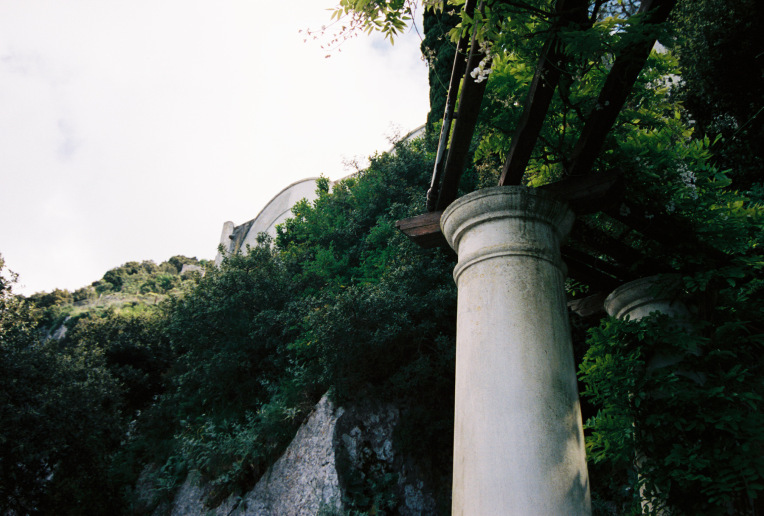 Although the villa is high up on Anacapri, there are soaring rocky cliffs surrounding the grounds. One rock was the the fort overtaken by the pirate Redbeard, which was later owned by Axel Munthe and donated back to the island (but owned by) his Swedish foundation. The veranda, home to a sphinx, invites visitors to wander the beauty of the land on shining hand painted white tile and stone, dotted occasionally by benches to rest on and try to flimpse the views from every angle. Charming path way walks are lined with greenery, flowers and fountains. Every turn on the grounds is more and more magical. I cannot recommend enough an hour’s visit to the Villa for it’s peacefulness and beauty. On hot days it’s a cool and shady refuge. There are olive jars, more cypresses and Roman Umbrella pines and a fascinating side view of the Egyptian winged pegasus-like female sphinx. The exterior of Axel Munthe’s chapel is wlecoming for a quick peek within its walls among the potted urns along the walk and a lush herbal garden. Hedges and shrubbery grown over decades now form natural fences. The clouds and mist find each other as a tiny boat leaves the shore for a morning of fishing. Because of Axel Munthe’s tireless advocation for the exotic array of birds who migrate to the island each year, Capri is now one seasonal giant bird sanctuary when birds from all over the world stop there for sojourn on their way further south. Bird hunting is outlawed. The beautiful song of many different birds can be heard from morning to night, when the nightingales come out. It is then when I can feel Keats poem, Ode To A Nightingale, alive in the air. Follow the ivy climbing over the columns and stone walls as you explore this garden for every corner is a delight. At the top of the steps are uniformed pots of green plants and spring buds, standing at attention for your wander about. On one path a sign leads to the café, a welcome distraction after all that beauty. Doesn’t everyone at a museum always love a café? This one is a rooftop one in the garden. Gnarled vines from long dead plants wind themselves around majestic trees along a columned loggia. 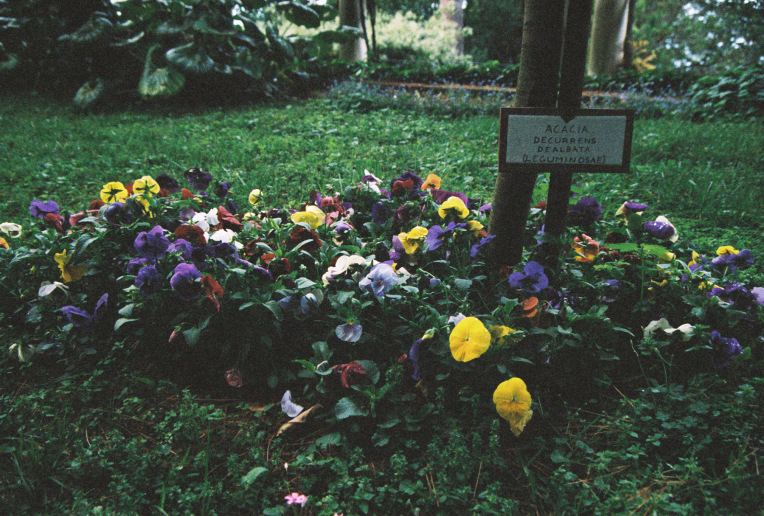 The exotic and native flowers in every hue are marked and greet thousands of visitors each year. A stone water fountain which looks completely natural bubbles forth in between ivy, basil and shiny leaves. There’s mint and rosemary and too many herbs to count. A few Egyptian looking palm trees and several umbrella pines recall Capri’s ancient Roman days when the island played host to emperors and sirens. This is one of my favorite spots…I feel a sense of happiness and pleasure whenever I pass under the leafy canopy and approach the café. This is my dream garden. 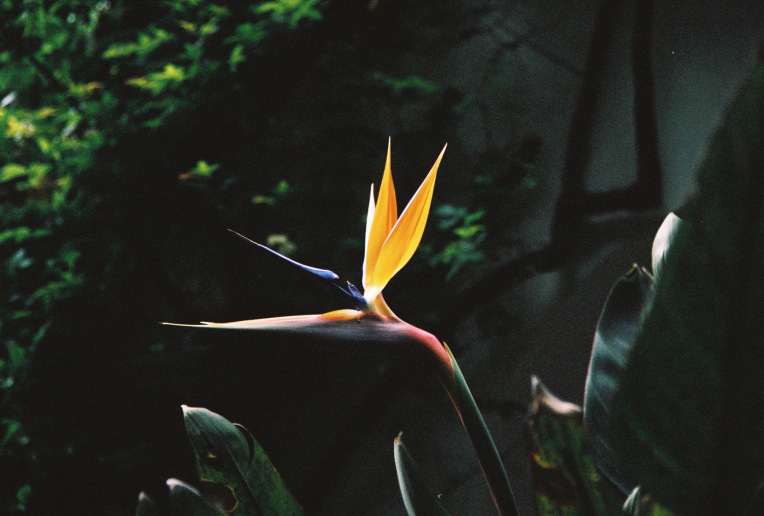 Whenever I see a Bird of Paradise I think warmly of my mother and her love for them. This was the most perfect one I’ve ever noticed. 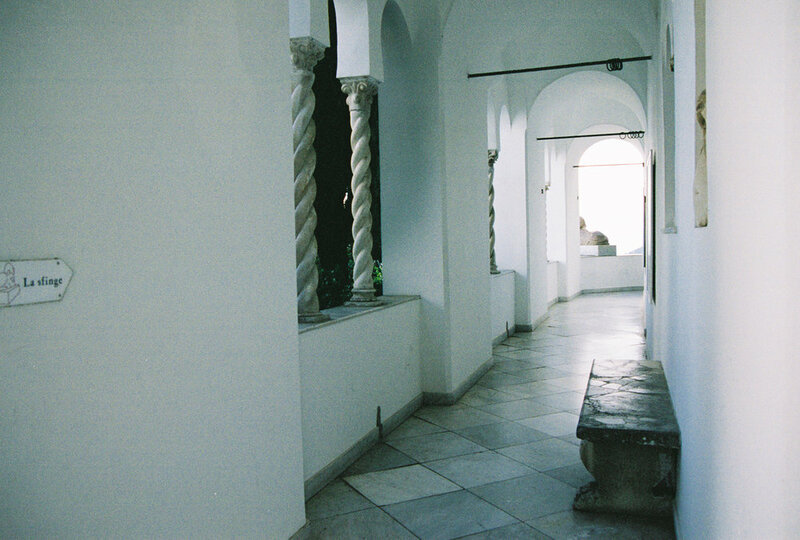 The Loggia has many windows to the sea and other curves of the garden. They are filled with manicured folder pots and Greco Roman statues. Roses climb the walls in every soft color. Some of the architecture reminds me of a Spanish style church, some is a bit Occidental, some a little Roman and the rest an eclectic mix of early 20th century and Capri-style. Each path ends with a different corner of the grounds, each turn is so inviting it’s difficult to choose one lane over another for the promise of their beauty. Where ever you end up in the next step, it’s easy (and enjoyable) to get lost. 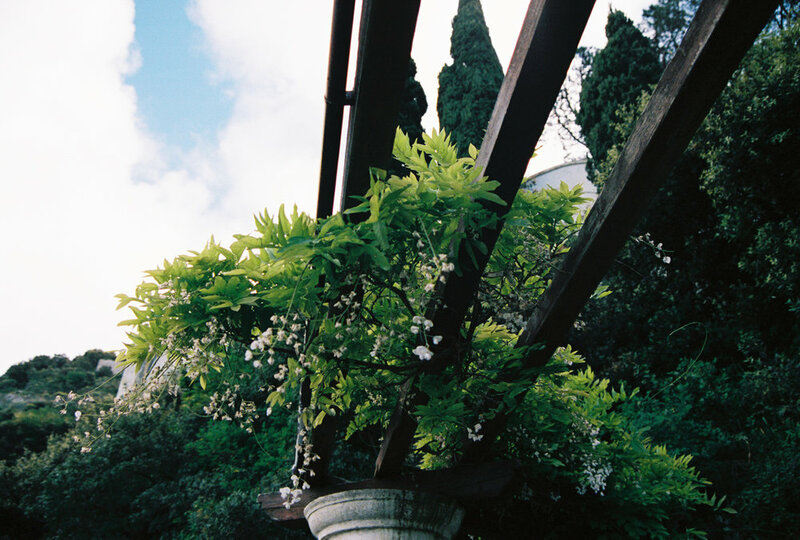 You always wind up at the heart of the garden and of Capri herself. If you remain quiet and strain your ear just a little bit and listen past the songs of birds, you may still hear the faint call of the sirens on the rocks below you. For CAPRI VISITOR INFORMATION visit: villasanmichele.eu . 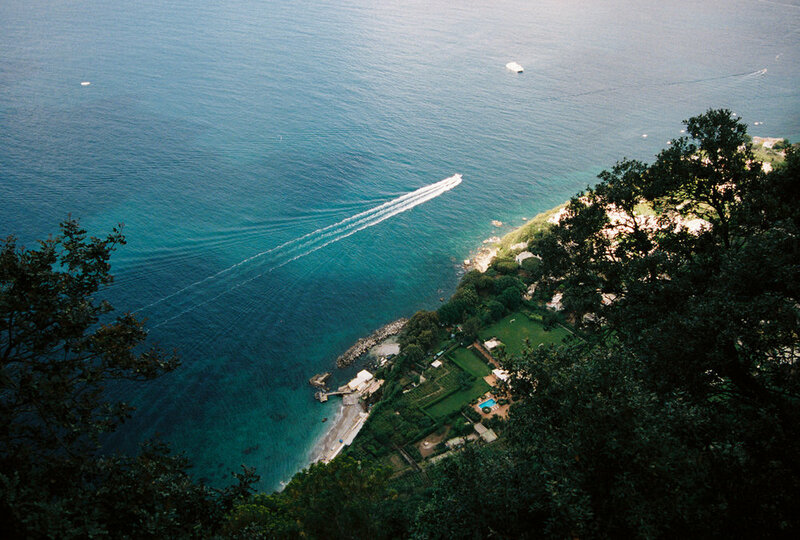 If you find yourself on Capri, even for a day trip, you must take a convertible taxi or the bus up from the Marina Grande or Marina Piccolo or from Capri Town to Anacapri (because it’s less crowded, lovely and full of hand painted tile, jewelry and sandal artisans) and it is the home of the Villa San Michele! You won’t regret it! The views, the peace, and the little cafe with sandwiches and antipasti, desserts, coffee, and a local wine list and champagne all have lovely spots to stand and sit and enjoy a respite from the fast pace of travel. And you will fall in love with the place as I have. Exploring Villa Lysis, an Aesthete’s Retreat in Capri from VOGUE.COM Greek Revival architecture in a villa museum with incredible views of the Marina Piccolo and the other side of the island from the Villa San Michele. Casa Rossa - Anacapri - Art museum with statues from Classical Antiquity brought over from Tiberius, Caligula, and Augustus, and Neapolitan and local Capri paintings and photographs from the last 200 years. 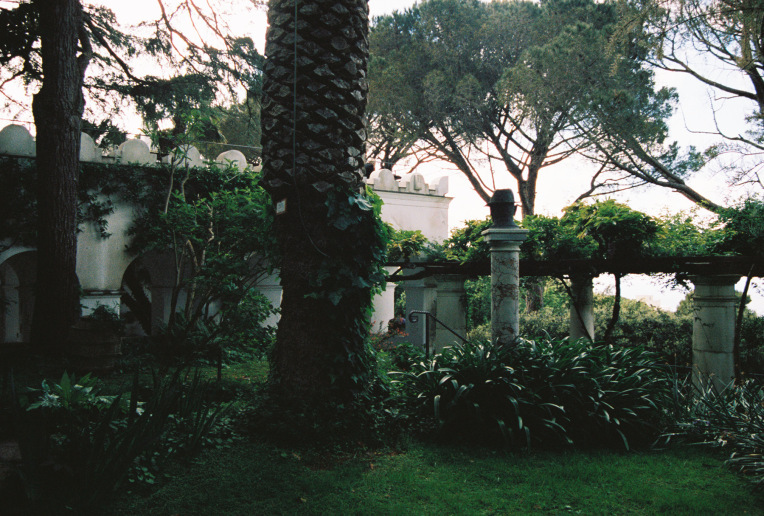 The gallery of photographs of the Villa San Michele series were shot on portra 35mm film, velvia film slides, and on vintage kodak.